When a presentation goes horribly wrong, Adam Cassidy (Hemsworth) find himself without a job but still holding a corporate expense card that he decides to put to good use by showing his newly unemployed colleagues how the other half lives even if just for one night. 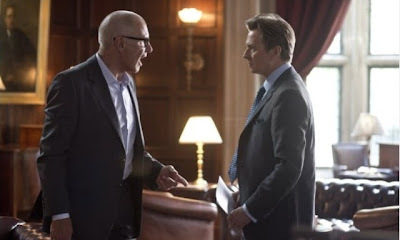 When his former boss Nicholas Wyatt (Oldman) catches wind of Cassidy's transgression, he uses it to pull the young man into the web of corporate warfare being waged between himself and his mentor turned rival, Jock Goddard (Ford). With both sides playing him against the other, Adam must find a way out before he becomes just another casualty in a high stakes gamble that could leave both empires in ruin. On the surface this sounds like a really good story backed up by a top notch roster of talent that includes some serious heavyweight talent. I mean, who wouldn't want to see Harrison Ford go toe to two with Gary Oldman in a winner takes all battle of the minds. You also get up and comers Amber Heard and Hemsworth who I'm sure us hoping to get out from under the god-like shadow of his older brother Chris. Maybe that time will come when his character in the Hunger Games movies gets more shine, but this movie does absolutely nothing to advance his career. As a matter of fact, I would have to say that all four of the actors with their names on the poster are hoping this movie gets locked away and hidden or, at the very least forgotten. 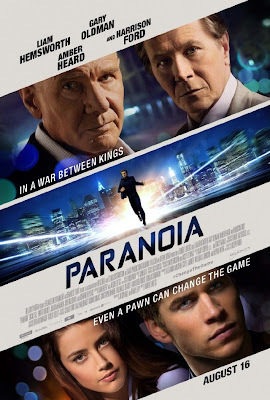 Thankfully, Paranoia clocks in at 106 minutes but, as you sit through a story that doesn't ever reach any sort of intended level of tension, it feels more like double that amount of time. The most disappointing thing about this movie is not how good it could have been as it never really had a chance, but in how it gets your hopes up by throwing all those big names on the marquee only to leave you with a picture that falls way short of even lowered expectations.